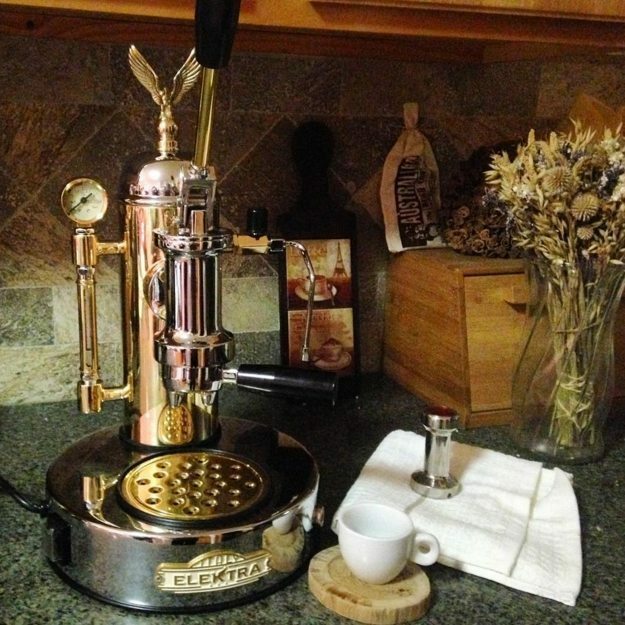 Elektra S1CO lever espresso machine for the home features a beautiful combination of chrome and brass. The dedicated retrò style attracts the gaze and bestows elegance on the surroundings. The gleaming chrome and brass are the mirror of unrivalled quality. And their performance in making quality espresso and cappuccino equals their beauty. The Elektra chrome and brass manual espresso maker for the home features a very special design. The retrò style attracts the gaze and bestows elegance on the surroundings. The gleaming finish is the mirror of unrivaled quality. The S1CO's performance in making quality espresso and cappuccino equals its beauty. Exceptional espresso and an awe inspiring design provide the best of two worlds. The polished chrome and brass finish combined with Italian retro styling make the Elektra S1CO the center of attention. Lever operated, you pull the lever down against a spring piston, which when the lever is released, pushes hot water through the coffee resulting in a consistent, perfect espresso extraction. The pressure gauge shows the steam pressure in the boiler. When the needle is in the green area you are at the optimal time for preparing espresso. With a volume of 1.8 liters, the boiler provides exceptionally dry steam for frothing milk for cappuccino. Only theory in my brain- and it worked as I thought it would. Before buying this, I had only in my mind, the idea of what needed to be done. I must say-its cake. Sure getting a tamp down perfectly every time is tough and will take some time- but in the first day I was making some great shots. This works perfectly. Also for descaling- I see a lot of different information. A brass boiler safe descaler will work) BUT THIS IS WHAT NO ONE MENTIONS- Due to the main boiler cap and steamer threads- it is very easy to rig up a flush from your sink to the unit and then out of the steamer. Let this run for a bit and you are going to get 100% flush of the boiler and sight tube. Not really sure why that information is missing all of the internet- for any of these manual machines really...seemed like a simple idea. It works- and you dont have to shake the machine around like some reviewers mention...which seems totally stupid by comparison. Only thing that seems "cheap" would be the plastic ball valve knob. I am sure this is to insulate the temperature but it would have been nice to see something a little more formal on this machine-perhaps a knob that was more slight. I'm totally happy with this purchase, even though it was more money than I wanted to spend. I've had other espresso makers and I've always been disappointed at how difficult it was to get a high quality espresso with good crema. 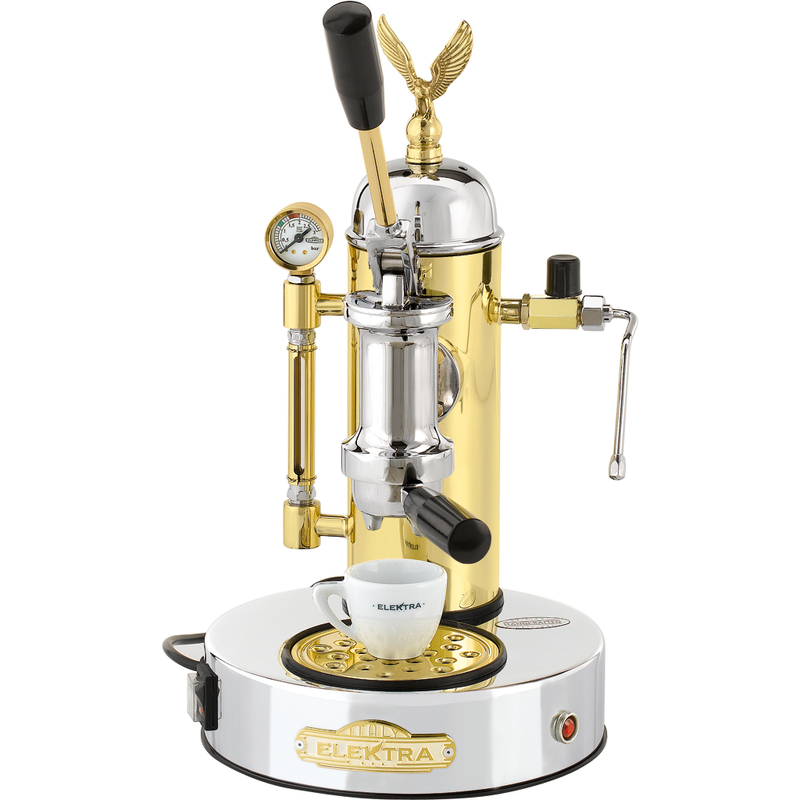 This Elektra Casa-Leva delivered top quality espresso with good crema first try out of the box. I expect it will be even better with fresh roasted beans and a little bit of practice. The machine is gorgeous and functions beautifully. I can't imagine that I'll ever need another machine than this one. !st in Coffee's customer service is great. The folks are informed and friendly and were easily accessible. If you are weighing options for a lever machine and aren't sure you want to spend the extra money for this one, go ahead and splurge. It's worth it if you can manage it. Top quality espresso machine. A little pricey but you always get what you pay for. Very happy with my purchase from 1st in coffee.